Random Acts of Shifeness - Halloween ... already?!?!? 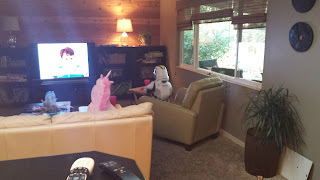 Do you hear the one about the unicorn and the stormtrooper that walked into a bar ... errrr .... living room? Yep it's only Sept. 15 and I already bought their Halloween costumes. Anybody care to place odds on that those are the same costumes they wear in 46 days. Yes we looked up how many days until Halloween this morning. Here's a better look at Hayden as a unicorn. And here's Kyle being Kyle because Mr. Rosewater gives me the business if I don't put some pictures of the big guy in there as well. Speaking of big guys, there's a Tank in the background. Speaking of Tank again, the Shifley household has puppy fever. We are looking, but it's insane what some people are asking for a basset hound puppy. Any guesses? If you said $1,000 then you are a winner. I'm seriously concerned that the gene pool has been thinned way too much. This was an actual 911 call: Had a lady trying to call an ambulance because she opened a package from Amazon at home and she was afraid that that her kid was about to have a major allergic reaction... From the packing Peanuts.... because the kid was allergic to peanuts, and when her kid mentioned what they were called, she freaked out. Enjoy your weekend. Thanks for stopping by. You're the best. I wouldn't worry too much about the Halloween costumes; hopefully that's what they still want to wear. As for my kids, Mommy hasn't decided what Julia is going to be and Colin's has to be custom made. He wants to be Kid Danger and as the parent of a 7 year old I expect that you know who that is. I miss making costumes with my kids. And going out with them. Well, only if it's not raining. Are you stuck on bassets, or would you consider a shelter dog? the storm trooper looks excellent. has kyle done a time and motion study to see if that costume will slow him down collecting candy? i think spring would be the ideal time to get tank that assistant security officer. A new puppy would be good for all. Love that idea but I'm stuck with a cat. Your kids look very cute. Have a great weekend! Those kiddos are so cute and look like they're having so much fun! I think Halloween will be the favorite holiday in the new Noisewater family. I was thinking of me and my kid going as Dr. Evil and Mini Me. Is that too dated?